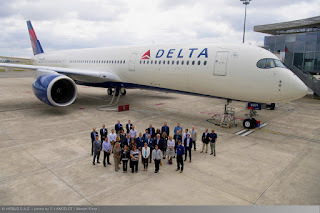 Atlanta-headquartered Delta Air Lines has become the first North American carrier to take delivery of the state-of-the-art Airbus A350, which will begin serving the Detroit-Tokyo route in late October. Delta (NYSE:DAL) took delivery of the extra-wide body A350-900 on July 13. The 306-seat aircraft, which is the first long-haul aircraft to feature next generation 2Ku internet connectivity, will fly primarily on routes across the Pacific, initially to from Detroit Coleman A. Young International Airport (DET) to Tokyo-Narita (NRT). Future service will also include Seoul Incheon International Airport (ICN) and Beijing, China (PEK). The A350-900 redefines the international onboard experience with the award-winning Delta One suite and Delta Premium Select cabin, the airline said in a statement. It includes 32 redesigned Delta One suites that include a full-height door at every suite for enhanced privacy and comfort. Every suite offers a full flat-bed seat with direct aisle access — a standard among Delta’s international wide body aircraft — as well as more personal stowage and large in-flight entertainment screens. In its Premium Select cabin, customers will have more personal space with up to 38 inches of pitch, up to 19 inches of width and up to seven inches of recline along with an adjustable leg rest and headrest. That compares favorably to the space available on the Boeing (NYSE:BA) 747-400s it will replace. On those aircraft, Comfort+ seats are 17.2 inches wide, with 35 inches of pitch. Free seatback in-flight entertainment is provided throughout the aircraft and includes high-definition screens. In-seat power ports are available in every row and high capacity bins are overhead. The aircraft has next generation 2Ku internet connectivity, which provides additional capacity to serve aircraft-based Wi-Fi than the previous generation Ka band, according to in-flight Wi-Fi provider GoGoAir. The A350 also features larger windows and optimized cabin pressure, temperature and humidity, which contributes to reduced fatigue levels following long-haul and ultra-long-haul flights. These enhancements are part of the airline’s multi-billion dollar investment in the customer experience that includes a cabin modernization program, free Main Cabin meals on select flights, upgraded free Main Cabin snacks, chef-curated meals in Delta One, a seasonal wine program, an Alessi-designed collection of serviceware in Delta One and First Class, and more, the airline said. The long-range Airbus A350 will continue Delta's optimization of its Pacific network, operating primarily on long-range routes between the U.S. and Asia. With a lightweight airframe and fuel-efficient Rolls Royce Trent XWB engines, the jets are expected to generate a 20 percent improvement in operating cost per seat compared to the Boeing 747-400 aircraft they will replace. The A350-900 is the cornerstone member of Airbus’ all-new A350 XWB Family, which is shaping the future of medium, long and ultra-long haul travel, according to the manufacturer’s website. In a typical three-class seating configuration, the aircraft will carry 325 passengers, though it can be configured to carry up to 440. With a wingspan of 212 feet, 5 inches and a maximum allowable take-off weight (MTOW) of 617,300 pounds, the A350 has a range of 8,100 nautical miles, the sixth-longest range of any commercial airliner currently in service. According to Aerospace-Technology.com, the Boeing 777-200LR is the world's longest range airliner with a range of 9,395nm. It is followed by A340-500 (9,000nm); the Boeing 787-9 Dreamliner (8,000 to 8,500nm); the Airbus A380, which is the world's largest passenger aircraft (8,477nm); and the Boeing 787-8 Dreamliner (7,650 to 8,200nm). To date, 95 A350s have been delivered to airlines worldwide. Qatar Airways and Singapore Airlines have each taken delivery of 15 of the aircraft while Cathay Pacific has taken delivery of 14. Finnair and Aircraft leasing company AerCap have each taken delivery of 10 of the aircraft.